Heat the milk in a pan on the hob, make sure you keep an eye on it so it doesn’t burn. Melt the butter in a pan and add the flour slowly, stir and cook for 1 minute. Slowly add the hot milk a little at a time, making sure to incorporate the milk properly into the butter and flour mix. Continue until all of the milk has been added. Add the nutmeg, mustard and season with salt and pepper. Remove from the heat and stir in the cheese and then the cream. Add the macaroni and mix well. Put into a tray and leave to cool. 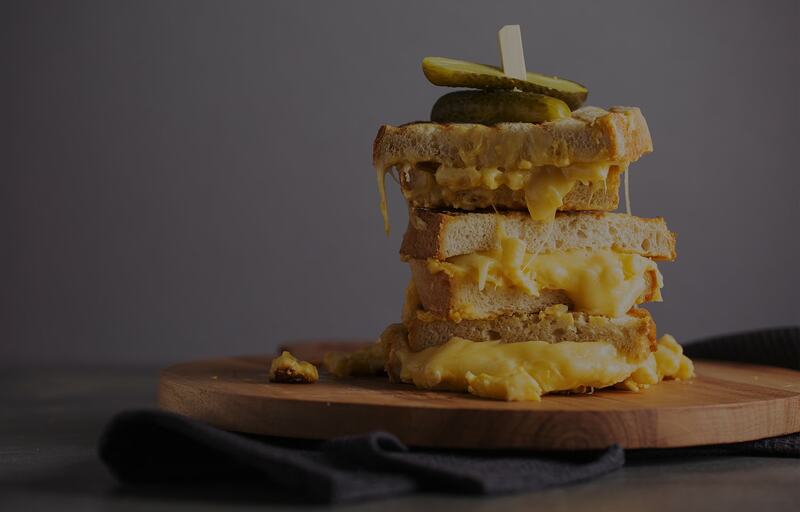 Sandwich your cooked Mac ‘n’ Cheese between 2 thick white slices of bread, butter facing outwards. Repeat until you have four sandwiches. Place sandwich onto the grill, butter side down, and grill for around 5 minutes of until the bread is toasted and the Mac ‘n’ Cheese is gooey. Repeat for all sandwiches. Serve and top with a pickled gherkin.